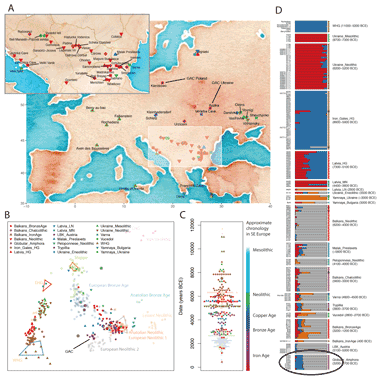 Overall, the phylogeographic analysis strongly implies that the western Eurasian founders, giving rise to Siberian specific subclades, trace their ancestry only to the early and mid-Holocene, though some of genetic lineages may trace their ancestry back to the end of LGM. Importantly, we have not found the modern northern Asians to have western Eurasian genetic components of sufficient antiquity to indicate traces of pre-LGM expansions, that originated from the Upper Paleolithic industries present both in the southern Siberia and Siberian Arctic, and that date back to ~30 kya, well before the LGM –. Apparently, the Upper Paleolithic population of northern Asia, whose western Eurasian ancestry was approved recently by complete genome sequencing of 24 kya-old individual from Mal’ta and 17 kya-old individual from Afontova Gora in south-central Siberia, did not leave a genetic mark on the female lineages of modern Siberians. It is probable that the initial population expansion in the southern Siberia region involved maternal lineages other than present now, or that there was a substantial gene flow into the region after the LGM, most probably from eastern Asian sources as have been suggested by Raghavan et al. .